What are the Sustainable Development Goals or ‘SDGs’? The SDGs bring together the world’s greatest social, economic and environmental issues and show how they are interlinked. They are easily digestible, globally applicable, largely uncontroversial and have clear impactful goals, with targets linked to each one that can be turned into action. The Goals are a hook for action and debate on issues which traditionally have been seen as the domain of ‘others’ – of government or the NGO world, but not for business. Debated within the World Economic Forum and at its annual meeting in Davos, many CEOs are starting to see the importance and relevance of the SDGs to their business, and the value of having a purpose beyond profit. It can be overwhelming for a CEO to decide whether to prioritise global warming, local unemployment, education, food poverty or the local donkey sanctuary as a purpose for his or her business. 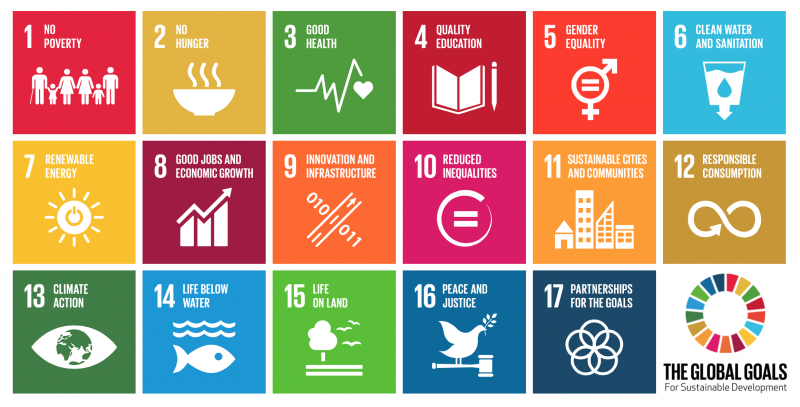 The SDGs help ‘unpack’ the potentially paralysing myriad of local and global issues and guide companies towards measurable goals and activities that align with their business. With fantastic branding and the help of British filmmaker Richard Curtis to ‘make the SDGs famous and popular’, as well as the involvement of international celebrities through Project Everyone, the Global Goals campaign has enabled greater public and media attention and helps companies to choose a purpose that engages their employees to do something they feel is important both in, and outside of, work. Take Goal No.1 “No Poverty”. Something that everybody can get behind. It’s a clear goal, though clearly not simple to achieve, and not always obvious to a company what exactly they can do to address it. Business Fights Poverty is a great resource for content, debate, events and Challenge activities for businesses wanting to address poverty as an issue. With a bit of creativity and help, companies can get started with practical local activities to fulfil their chosen goal, that engages their employees and can have measurable impact. For example, staff at commercial property and real estate giant CBRE have partnered with charity LondonYouth’s BuildIt programme to give practical experience and routes into the construction industry for young people who are struggling to find work. Cloud software pioneer Salesforce.com have a global skills-development program, BizAcademy, that has given hundreds of young people a helping hand into an apprenticeship, internship, job or further education . And Burberry has delivered a youth job-training program together with NGO Tomorrow’s People. These programs, as long as they result in real jobs and opportunities, can be the first step towards a company fulfilling the SDG goals of “no poverty”, of “good jobs and economic growth”, as well as others focused on health and sustainable communities. The SDGs are arguably the best framework we’ve ever had for companies, of any size, to structure their purpose, decide goals and activities that have positive social or environmental impact, and understand how their resources can transform the world. Get in touch to understand more about how you can develop a strategy to embed purpose into your business: isabel@profitwithpurpose.co.uk, +44 (0)7971 471269. Ideator (www.ideator.com) is also creating space for people to share their ideas, get feedback, grow their team, provide insight on tackling these goals.